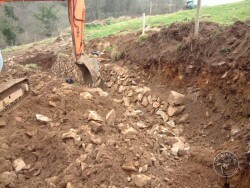 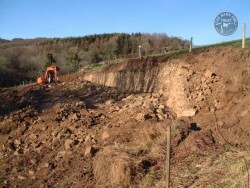 Creating a traditional Devon stone-faced and turf-faced hedge bank for our orchard was part of the Lennon Legacy Project; ‘Transforming 26 acres of sheep pasture into Barn Owl Heaven’. 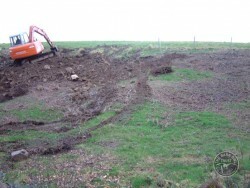 We are working to create perfect Barn Owl habitat and encourage as much other wildlife as possible. 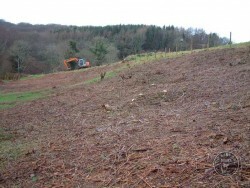 Find out what’s been happening this month, in our Wildlife Diary. 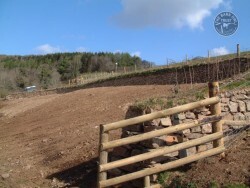 In 1841 this was an orchard. 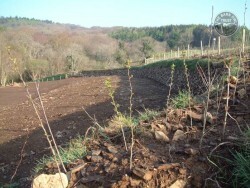 When we bought it in 2001 there were no fruit trees at all. 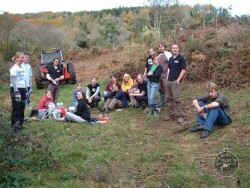 In October 2007 we began clearing scrub to re-create ‘Forde Orchard’. . .
. . . with the help of Plymouth University students. 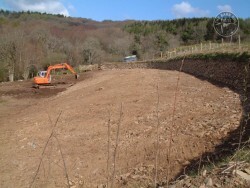 Landscaping works started in January 2008. 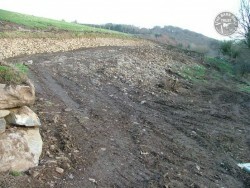 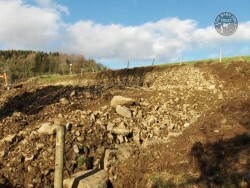 We decided to recreate the orchard boundary as a stone-faced bank. 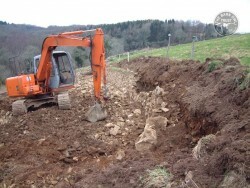 The original stone was excavated and re-used. 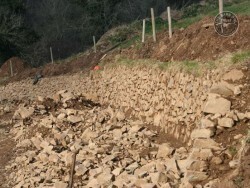 There was enough of it . . .
. . . to do the whole bank . . .
. . . without buying-in a single stone. 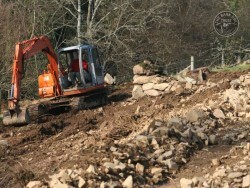 The biggest stones were used for the gateways. 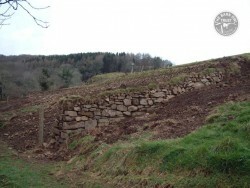 The stone-facing continued into February 2008. 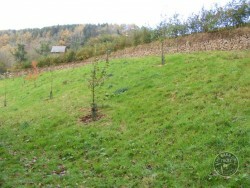 The top of the orchard slope was landscaped. 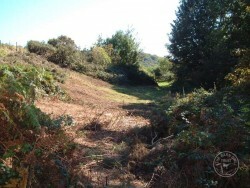 The lower part of the boundary would be a turf-faced hedge bank. 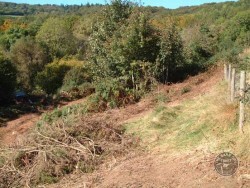 Once finished, the top of the bank was planted up . . .
. . . with a mix of native hedgerow tree whips. 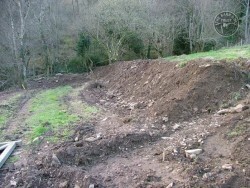 Then just a little tidying up. 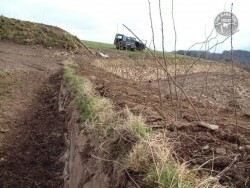 The whips were well-established and growing by the end of April 2008. 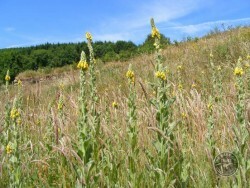 In 2009 we had an amazing show of wildflowers. 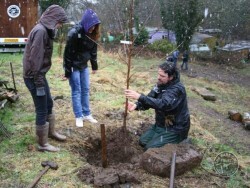 The fruit trees were planted in February 2010. 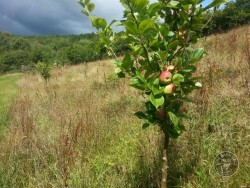 By 2014 most of the trees bore fruit – apple and plums – and they’re all for the birds!! 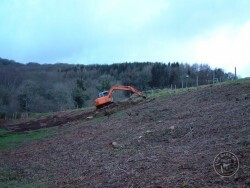 Have a look at how we’ve developed our wildlife haven, and some of the huge variety of species that now thrive there.